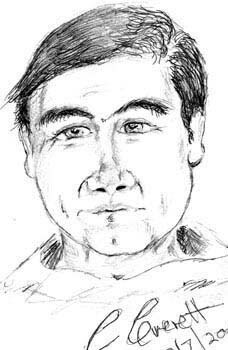 THIS ID Drawing of the 'murderer' was produced LIVE at Taunton CH6 TV Studios in the UK. The murder of Jonbenet Ramsey is now an old case. Bits of the story are also on the Boulder News web site. It's December 25th 1996 Six-year old JonBenet Ramsey is last seen when being put to bed at 10 p.m. Patsy Ramsey (mum) calls 911 after discovering a ransom note demanding $118,000 for safe return of JonBenét, She begs for help. Boulder police officers arrive at Ramsey home, conduct a quick search and report no signs of forced entry. Re murder, officials say JonBenet's two older children, half-brother John Andrew and half-sister Melinda, were out of town during "the incident". Police 'convinced' parents to blame for murder. Case continues this page created August 2001. 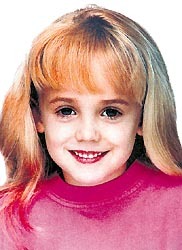 Jonbenet Ramsey 6 years old. The person responsible looks like picture above. He looks like or feels like some sort of delivery man. Has a uniform but not military. Could even be a postman delivering packages etc. Sure he has already been questioned by police and let go. He is not a relative and seems to be involved in drugs. He appears to have a small scar on mouth, possibly a hair lip which has been around since childhood. Distance. About twenty minutes to half an hour max. driving in a car, from the Ramseys home. How did Carol Everett get interested in this case, and why. Carol got more interested in the Jonbenet Ramsey murder case after being invited on a UK TV talk program on 13th July, where she was asked to draw a portrait of Jonbenets 'murderer'. Carol has done this sort of intuitive ID work successfully for the police cases previously (see past case pages). Only the night before a documentary about the case had been aired on UK Television. Inspired by this, Carol was going to be doing a drawing at some point for this case, so everyone thought it a good idea to actually tape it happening for the program. Carol at the time also produced a 'psyc' person profile of the 'person' responsible. A video of the drawing actually being done by Carol is also available in Real Video format via a link from the top of this page. The UK TV documentary covered the already known details of the case. Also how the evidence supporting the parents had been so hard to get presented, by a guy called Smit. Carol is sure that Jonbenet's parents are NOT responsible for this crime. Coincidentally, while in LA in 1999, Carol had been asked briefly about this same case, and if she thought the parents had done it, this was live, during a cable TV program. The interviewer was Derdrie Wilson-Hass. At the time it was not really appropriate to comment particularly as we had not even heard about the case. BUT. Following the UK TV documentary program on the case, and the fact that not much had been done to find the actual murderer Carol felt inspired to see if she could draw the murderer and send it to the police investigating the case.. The program on which Carol was appearing, the Jenny Smedley show based in Taunton, (www.jennysmedley.com) is a program covering a range of subjects including generally 'unexplained' stuff. Jenny interviews authors speaks with many people, some famous some ordinary, about their experiences.